Hurricane Florence is a storm we’ve been watching for a few days now… as we’ve seen models jump back and forth we advised caution and keeping an eye on this storm. It also wasn’t a bad idea to make preparations for this storm whether it be preparing to evacuate or to go to the store and get necessary supplies. 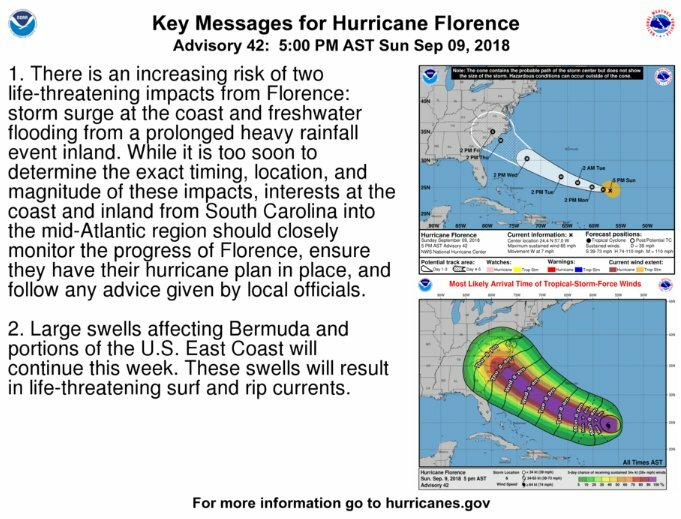 Sadly, it is looking more and more likely that Florence will impact the East coast of the U.S. between South and North Carolina. This storm is anticipated to undergo rapid intensification late Sunday and through Monday and Tuesday, current landfall projections are as a Category 4 storm. There are a few models that still take Florence back out to sea, but we’ve seen a lot more agreement on tracks taking the storm into the East Coast of the U.S. and especially in and around the Carolinas. Although not Colorado weather related, we urge folks with friend and family in these areas to keep in touch with those folks. Urge them to prepare for this storm if they haven’t yet… if this storm landfalls as a Category 4 it will be very significant. There are still slight chances the track shifts or the storm goes back out to sea but the models predicting that are becoming fewer and fewer. Please feel free to share the above resources with friends and family… all are from the National Hurricane Center so they are reliable information. We’ll keep an eye on the storm and pass any updates along this week! The biggest change to Colorado’s drought status for the week was the expansion of severe drought conditions across a good portion of Western Colorado to include many mountain areas. Many mountain areas have experienced above normal temperatures most of the summer and have been very dry. The expansion of the severe drought status is an indication that these areas are becoming quite parched as we move towards fall. Not much change from the past few weeks along the Palmer Divide. Most of the Northern sections remain abnormally dry with southern sections in the moderate drought classification. There are few areas in Southern and Eastern Elbert County that have made it into severe drought, but this hasn’t changed in the past few weeks. Why Are We Still in Drought? Often folks have short memories when it comes to weather, the past few weeks most areas have seen rain fueled by the monsoon and some areas have seen quite a bit of it! The thing with drought is, it’s not a short term problem and there are no quick ways to knock out drought. Not terrible but overall precipitation was just a tad below average… so whatever our drought status was at the time, we didn’t receive enough to dent it but weren’t dry enough for it to become too much worse. If we zoom out just a bit more and look at the entire year the picture becomes a bit more clear. Castle Rock is over 2.5 inches below average for the year. This doesn’t sound like much, but 2+ inches is a big deal. When you look back at the beginning of the year especially, you can see how dry our winter and spring were. Spring being one of our wet times of the year; if we fall behind in March and April, it is difficult to make that up for the rest of the year. Speaking of March and April, when we look purely at snowfall for snow year (September 1 – June 1), we can see more evidence of why we are still in drought status. Castle Rock was over 13 inches below average for snowfall last season. That combined with the overall lack of precipitation compounded our drought conditions and is a big reason why we are still seeing stress on vegetation, not to mention fires still going across the state. By the way, for the snowfall season September 1, 2017 – June 1, 2018 Castle Rock was nearly 6 inches below average for precipitation. That is an enormous amount of missing water! Figuring out how long a drought will last is not an easy task, it requires a lot of long range forecasting and a bit of luck. With an El Nino pattern brewing for us going into fall and winter, there is reason to be optimistic about our chances of a wetter than average fall and winter. This is whole topic in and of itself and will coincide with our long range forecast for the Palmer Divide (looking at fall and winter conditions expected for 2018-2019) Stay tuned for that and we will have more details on that and if we think our drought will be broken anytime soon. So remember, drought is a long term weather phenomenon. There is no quick start or end, it’s something that either builds or dissipates over a period of time. Our drought this year has been building since late 2017… with months and months of dryness a few weeks of rain in July is just enough to stop it from getting worse. It will take several months of above average precipitation to break us out of a drought, hopefully things pull together for us this fall! Precipitation anomaly for Sept 2018 – July 2018. You can see how the worst areas of drought follow along the driest areas on this map. 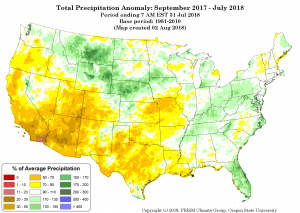 Don’t forget to look at the big picture, July 2018 was quite wet, but overall for the past year we’ve seen many more abnormally dry months than abnormally wet months! 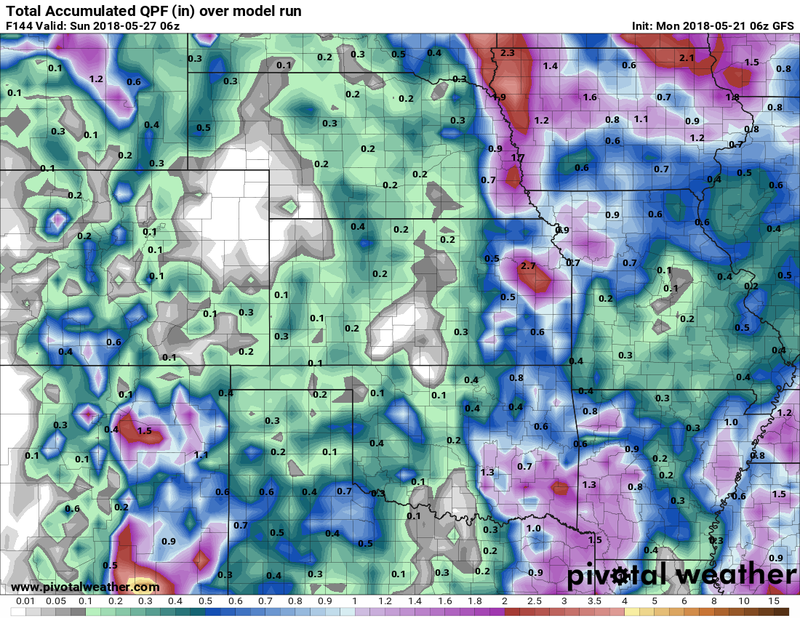 The 2018 summer monsoon pattern has firmly established itself across the Southwestern United States and with it moisture is being funneled into Colorado. Many areas have seen strong storms with hail and heavy, flooding rains over the past few days. The summer monsoon is a pattern that shepherds subtropical moisture into Colorado. As with most storms the past few days, there is ample moisture and instability for stronger storms to pop up with a threat for heavy rain, wind, lightning and large hail. Be prepared to move indoors or take steps to protect property with any storms that form this afternoon. Frequent lightning means don’t get caught unprepared outdoors. Be ready to move inside or take shelter! Please note! Models show an additional wave of storms moving through later in the evening around the 7-9PM timeframe. Thursday, the high pressure ridge responsible for our hot and dry conditions shifts slightly to the West. This means good moisture from the Gulf of Mexico will make its way into Colorado. That combined with weak steering winds, means storms will move slowly and have the potential for heavy rain! A Marginal Severe Weather risk encompasses the Palmer Divide and most of Eastern Colorado for Thursday. Storm chances are in the 60-80% range today; I like those odds. Most folks will see beneficial rain today but due to the instability in the atmosphere we can’t rule out a very isolated severe storm. For those of us along the Palmer Divide, the best chance of seeing storms is in the 4pm-8pm range with additional storms possible until midnight. Please stay weather aware! The week ahead looks to transition back into a more summer pattern for Colorado and most of the Southwest and South. As the storm system responsible for our cooler air and rainy conditions departs off to the Northeast, a high pressure system moves in from the Southwest. 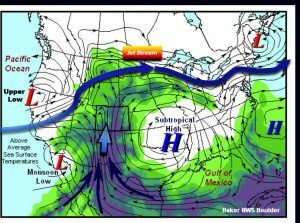 High pressure generally means the storm track gets steered away from Colorado and hot, dry, desert air from the Southwest gets pushed into Colorado and the Southern and Western United States. On the 500mb (upper level air) model below, we can plainly see the low off to the East and the high building in over SW Colorado. This model run is for Tuesday and subsequent model runs show this feature strengthening through Wednesday and Thursday. Upper level ridge (high pressure system) seen building over Southwest Colorado for this model run on Tuesday June 26. So what does this mean for our weather this week? Plainly put… it’s going to get very hot. Possibly some of the warmest temperatures we’ve seen in at least a year and possible a couple of years. Here’s a look at forecast high temperatures for Tuesday – Thursday this week. Toasty to be sure, but honestly I think the temperatures from this model for Wednesday and Thursday are a bit cooler than they will end up. A lot of the model ensembles show temperatures pushing or exceeding 100 degrees in Denver for Wednesday and Thursday. If that occurs, expect temperatures along the Palmer Divide to trend upwards a few degrees from what you see above as well. Expect mild conditions on Monday as the ridge hasn’t quite built in yet. By Tuesday we begin to crank the heat up a bit but the hottest days will be Wednesday and Thursday by far. Chances for rain or thunderstorms look low (generally 10% or below) through Thursday. If you have outdoor activities this week, stay cool and hydrated. Sunscreen will also be an absolute must! Take a quick look at an overlay of large active fires and surface winds this morning in Colorado and you’ll see exactly where the smoke is coming from. Large fires to the Southwest and South with strong winds from the Southwest and South are acting as a conveyor belt to move all of that smoke into the area. The smell is quite strong, so be aware that air quality issues will exist today. As of the time of this article writing, there are no large fires active in Elbert or Douglas County. That being said, don’t let your guard down; extreme fire conditions exist today for a good chunk of the Palmer Divide and nearly all of Central and Western Colorado. Fire Danger will be extreme today so be vigilant, no burning or activities that create a spark and/or flame. Additionally, if you see an area of smoke (that isn’t related to what we already have in the air) call 911 and report it immediately. It looks like we will have a few more days of conditions like this until our pattern changes early next week. Hopefully that will offer us a bit of relief from the heat and the dry conditions. We will have more details on that this weekend! By the way, you can see active fire information here. The “unofficial” kick of to cycling season will start this weekend in Castle Rock as cyclists can choose a variety of courses that vary in length and difficulty. 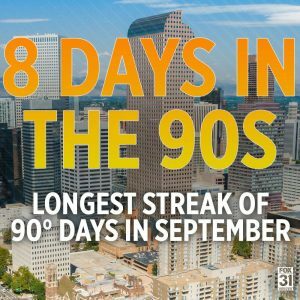 Colorado’s weather is known to be quite changeable, but the good news this year is that the overall weather is excepted to be calm. The only thing folks may have to content with is an extreme in temperatures, mainly in the morning and possible in the afternoon for the longer routes. Registration pickups and positioning at the start line starts at 5:00AM. Temperatures will be a bit chilly in the upper 40’s and low 50’s but the wind will make it feel like low to mid 40’s. Be prepared to have some warmer gear to start but you will probably end up shedding it very soon. Not much change by the time the 2 longer routes get rolling. Expect mostly sunny to partly cloudy skies along with light winds and apparent temperature in the mid 50’s. Temperatures will begin to warm up at this time but should still be relatively comfortable if not a bit chilly. Weather conditions will maintain through the start times of the next two routes, temperatures will be slightly warmer but still cool and sky’s will be mostly clear to partly cloudy. The only change is the wind is expected to pick up slightly as we progress through the morning. Temperatures will begin to transition warmer as the morning goes on and the biggest challenge we really see at this time is wind is expected to pick up. Expect sustained winds in the 15-20mph range with gusts into the 30mph range. This will become a bit of a challenge for riders on the longer routes still making their way South, but riders heading North will be happy with the tail-wind. Temperatures will reach their afternoon highs in the mid 70’s during this time. Winds out of the Southwest and South will help riders heading back with a nice push. Wind speeds overall will increase a bit but model guidance has them topping out in the 15-20mph range with gusts in the 30-35mph range. There is a small (20% chance) of a stray thunderstorm in the area during the afternoon. As the last few folks make it over the finish line we will see partly cloudy to mostly cloudy skies across the area. Surprisingly, winds are supposed to relax a tad later in the afternoon, the exception will be near any thunderstorms in the area as gusty outflow winds may make things tricky around those storms. Overall not too bad of a day weather wise, the heat won’t be oppressive, temperatures will be cooler and the only real challenge will be the wind. Honestly, if you time the longer routes right and are heading back by the time the winds pick up they may actually help more than hinder. Other than that, please remember the sunscreen, while it won’t be super hot the UV index will be quite high so sunburn is possible within an hour or less… especially once the sun is up and cranking after 9-10am. Thanks for reading, I’ll be at the race so if you see me say hi! 5/28/2018 – Heads Up! Severe Weather Expected Today! Today looks to be an active thunderstorm day with severe weather expected across much of Northeastern Colorado. The main threat out of theses storms is large, damaging hail but given the low level moisture and wind profiles there is an isolated tornado risk as well. The Storm Prediction Center has highlighted some areas of NE Colorado with a significant hail risk. This means some storms are expected to have “damaging/ significant hail greater than 2 inches in diameter.” Hail of this size could cause significant damage so please stay very aware this afternoon if you are in any of the risk areas. 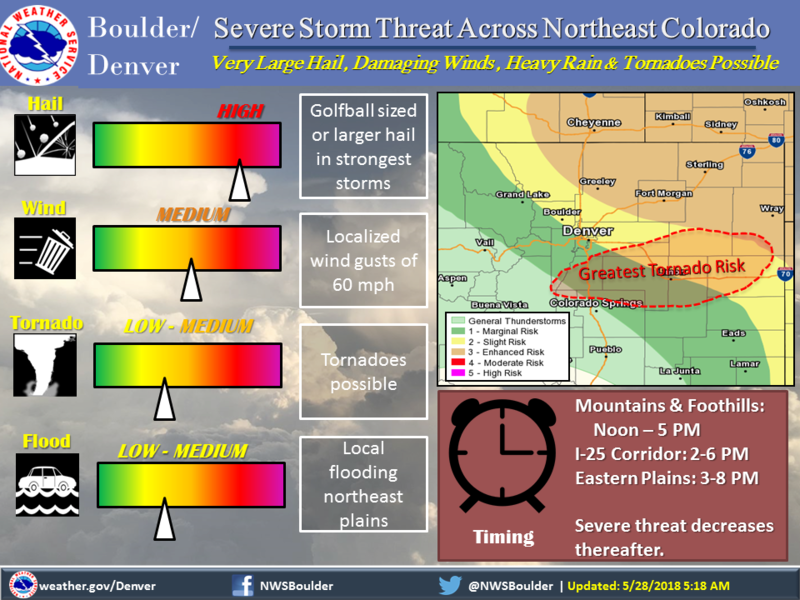 The Palmer Divide region is highlighted for a medium risk of tornado activity today. While these won’t be widespread by any means, the risk is there and people need to be aware of it. If you are outside and doing your BBQ this afternoon, keep an eye on the sky and have a good way to get weather warnings. Severe storms will kick off most likely after 2PM, morning models have the Palmer Divide region getting especially active between the 3-5pm hour. Stay aware in case storms kick off earlier in the afternoon, we’ve seen this a couple of times this year. Have an eye out after 12PM just to be sure. Models consistently show the Palmer Divide as an area of high activity today. Please stay weather aware if you are in these areas! I will be on and off social media today, as always we are a great source of weather but not the best for live warnings. For that I recommend a phone app with a warning system or stay tuned to local TV. The National Weather Service in Denver also has a Facebook Page and a Twitter where they post weather warnings.I may storm chase today, if so I’ll be sharing things to my Twitter and Facebook Pages. Stay safe out there today! After bouts of severe weather last week including storms that brought hail, heavy rain and winds to the area we will quiet things down nicely this week. The overall weather pattern is already beginning to transition into something we tend to see in summer with warmer temperatures riding into the area with Southwesterly flow and drier conditions as thunderstorms struggle to build in a more stable atmosphere. 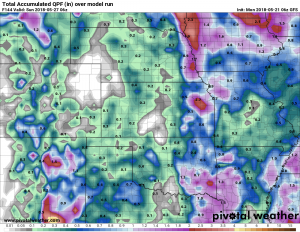 When we look at total precipitation expected this week, numbers will be much less impressive. Storms will struggle to gain much traction outside of the mountain areas and that means drier conditions along the front range. The GFS model below shows very little to no precipitation this week through late Saturday. While the pattern looks “summery” this week, it won’t be particularly too hot in and around Colorado. 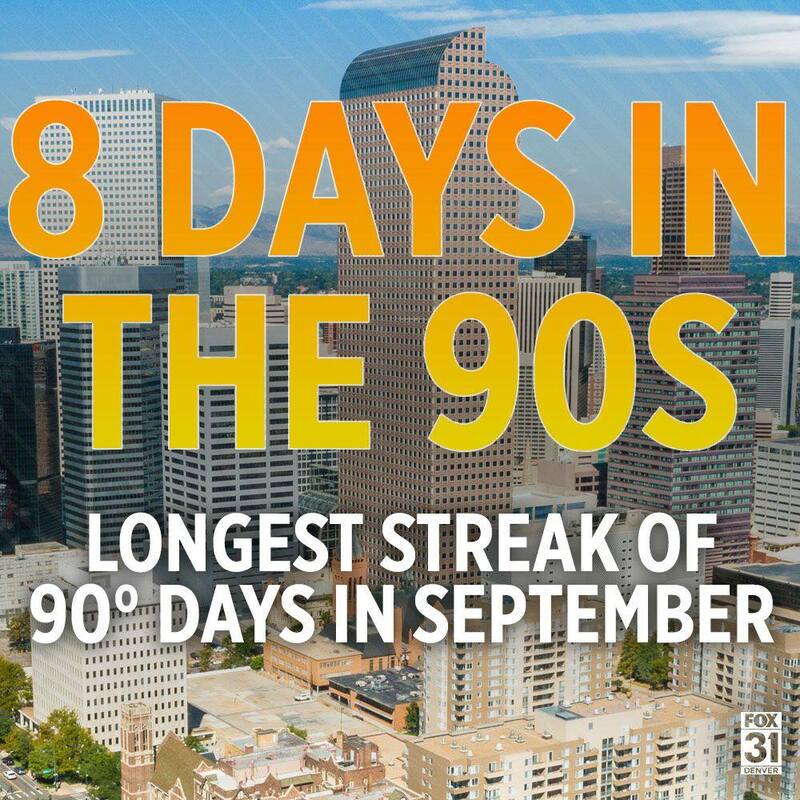 The areas that will see the heat will be just East of Colorado; Kansas, Oklahoma and Texas will see temperatures in the 90’s by later this week and I wouldn’t be surprised to see some areas flirt with 100 degrees. GFS high temperatures for 5/26/2018, most of the week will feature warm temperatures for the middle of the country. 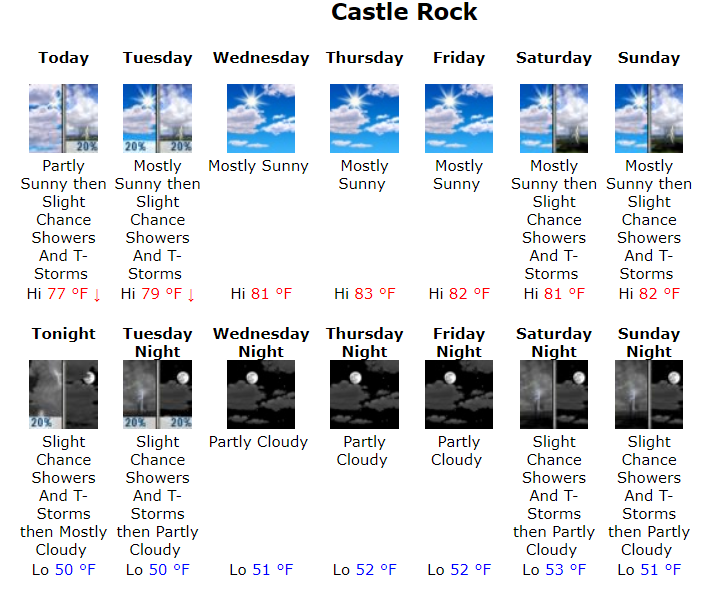 I’ve attached the NWS forecast for Castle Rock this week below, you can always view this forecast (updated all day ever day in 15 minute intervals) on our Castle Rock Weather Forecast Page. We will keep an eye out for any changes but beyond a spotty thunderstorm here and there it should be a relatively quiet and warm week. Have a great Monday!